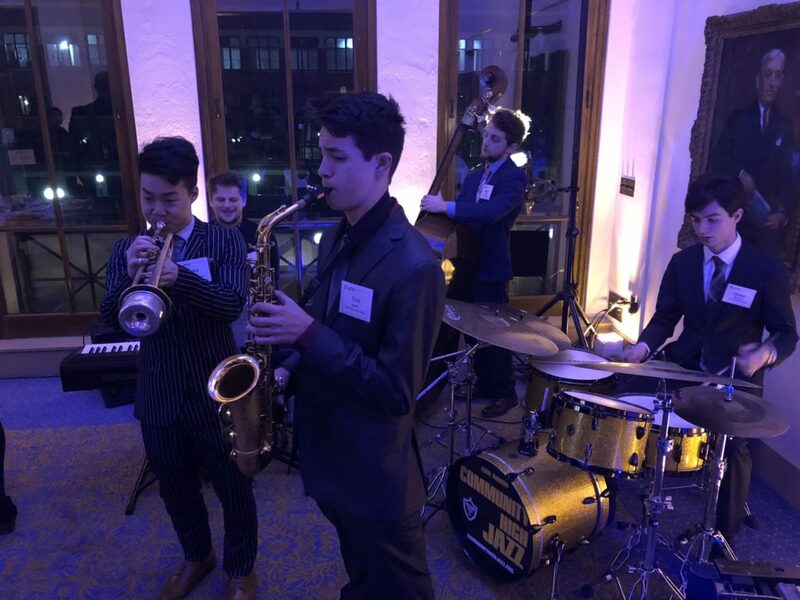 It was a night to remember at Hill Auditorium Monday when Community High’s jazz combo ‘Unified Field Theory’ performed for Wynton Marsalis, the esteemed director of the Lincoln Center Jazz Orchestra, Juilliard’s Jazz Program, and a nine-time Grammy winner and Pulitzer Prize winner. UMS hired the combo to be the sole (and soul) entertainment for a private dinner party of about 60 guests. “He was very complimentary of the students and their playing,” said Jack Wagner, Community’s jazz program director. “The students deserved it! They played beautifully and caused quite a buzz with the guests. We put in a lot of extra time rehearsing and learning some tough music just for this occasion. The students who performed d were Jake Lee, Tim Kohn, Aris Chalin, Oliver Mayman, Jonah Eichner, and Terrence Vick. Wynton Marsalis listening to the kids perform, encouraging them as they played, and then congratulating each of them individually. 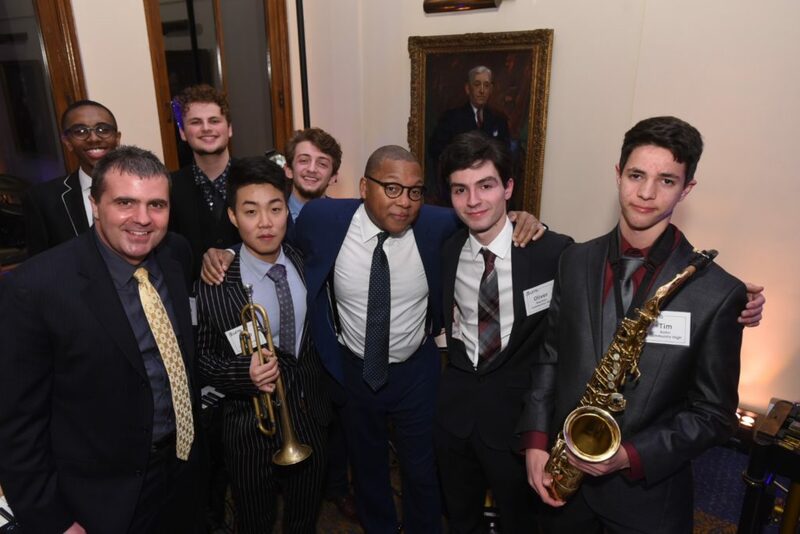 CHS Jazz trumpet student Jake Lee, during dinner, sitting between Lincoln Center Jazz Orchestra’s tenor saxophonist Victor Goines and 7-time Grammy/4-time Emmy winner Bob Hurst, who is the bassist on Paul McCartney’s latest album and was an 8-year member of The Tonight Show Band with Leno. Terrence Vick and Tim Kohn sandwiched between Emmy-winning CBS reporter and show-host Carol Cain and Lincoln Center Jazz Orchestra’s alto saxophonist Ted Nash for dinner. The students getting to perform for (and hobnob with) folks like NFL Linebacker Dhani Jones (from the Giants, 49ers), executives such as Marianne Udow-Phillips, Peter Schweitzer, Mark Bernstein, Matthew VanBiesen, and UM Athletic Director Warde Manuel. Marsalis’s speech on how we are ripe for a revolution that is steeped in love, honest exchange of far-reaching support, and how the arts lead the way in these pursuits.